Look at that little nuggetmuffin! Julianne and David welcomed Mason on January 7 and he is an adorable little peanut, as well as knew he would be. Julianne reports that she is thoroughly enjoying spending time in the nursery with Mason which makes my heart sing. I can't wait to watch this little boy grow up as we welcome him to our family of friends. Thanks to Juli for subjecting him to a photo shoot for the blog. I have a very large to-do list this weekend...there is a lot of painting in my future. Hope y'all have a stellar weekend...see you Monday! That is a very cute baby! He is a cute little nugget! That is what I call my son!!! 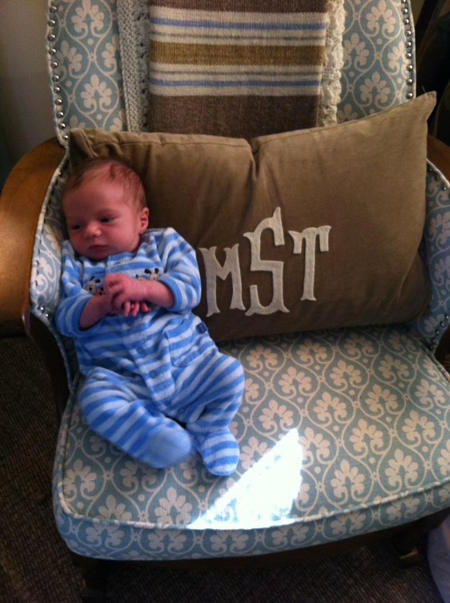 I am dying for that monogrammed pillow! Do tell!!! !